Someone is trying to kill Lila Hilliard. During the Christmas holidays, she returns from running errands to find her family home in flames, her father and brother trapped inside. Later, she is attacked by a mysterious man on a motorcycle.... and the threats don't end there. As Lila desperately tries to piece together who is after her and why, she uncovers information about her father's past in Chicago during the volatile days of the late 1960s... information he never shared with her, but now threatens to destroy her. 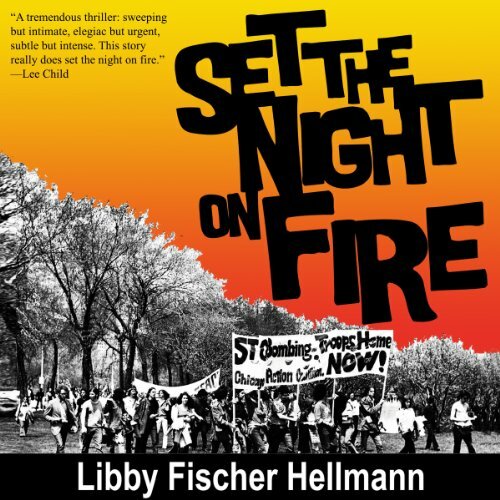 Part thriller, part historical novel, and part love story, Set the Night on Fire paints an unforgettable portrait of Chicago during a turbulent time: the riots at the Democratic Convention... the struggle for power between the Black Panthers and SDS... and a group of young idealists who tried to change the world. Set the Night on Fire was named a finalist in Foreword Magazine's 2010 Book of the Year in Mystery/Suspense. "Set the Night on Fire" will have special meaning to anyone who came of age in 1960s America. For me, it brought back some fond memories, some embarrassment, and some pride. Ms Hellmann has accurately captured the spirit and idealism of those times. With perfect hindsight, we can now see the rightness of our anti-war activism, and the wrongness of some of our methods. Against the backdrop of this activism, "Set the Night on Fire" (the title refers to the Doors' famous song) tells the story of what some of these 1960s youngsters did to voice their opposition to the Vietnam war, and the repercussions of their actions some forty years later. The text refers frequently to the Celtic Knot, which illustrates the interconnectedness of all things in time and space. What we did back then has a lot to do with what is happening now; and what I do now will have unforeseen consequences for someone that I may not even know. In "Set the Night on Fire," the decisions of '60s activists has unintended consequences for their adult children, one of whom must piece together long-buried evidence to save her own life. Ms Hellmann has skillfully crafted an intricate knot, in which many strands come together to solve the mystery, yielding a satisfying denouement. The narrator, Diane Pirone Gelman, has a lovely voice, and does an adequate job of reading this audiobook, but lacks the repertoire of voices and accents to warrant five stars. I recommend "Set the Night on Fire" to all mystery-lovers, especially those who lived through the amazing 1960s. I will certainly be listening to more of Ms Hellmann's audiobooks. Libby Fischer Hellmann has managed to incorporate history into a current story, bringing the reader the feel of the late 60’s, and providing an interesting storyline that will have you on the edge of your seat as the past moves forward to influence the present. The late 60’s in Chicago was a volatile time, with various groups seeking to make change in the social fabric of the United Sates, protesting against the Vietnam war, the ‘man’ and most all things establishment. While I am familiar with the more radicalized writings and justifications of bad acts, Hellmann brought forward the immense sense of guilt, confusion and the ease with which some may have been caught up in actions that escalated beyond their control. Would you listen to Set the Night on Fire again? Why? I loved this book when I read it in print and I loved it when I listened to Diane Perone Gelman's pitch-perfect narration. Libby Fischer Hellman does a superb job of bringing the past to life and making it relevant to the present. As the Vietnam War era fades from memory, the young people who protested the war may seem almost quaint in their naivete and wrongheaded in their methods, but their longing for a better world still resonates in our ever more violent time. Hellman uses the structure of a compelling thriller to dramatize the collision of past and present as old crimes and sins threaten the innocent adult daughter of two antiwar militants. Her characters are vivid and believable and the constantly building tension is engrossing, as long-hidden secrets are revealed and those who want to keep the past buried resort to murder to save themselves. The historical glimpses of a turbulent time. Have you listened to any of Diane Piron Gelman’s other performances before? How does this one compare? I have not. I was impressed by her performance. Great storyline merging the past and the present bringing back memories from my pre-teen years.